Availability: Download from http://audiodropcentral.com for $.89 per episode. Greetings, Audionauts! Captain Radio™ here with visit to AudioDrop Central. As modern independent audio theater production continues to flourish, one expects the art form and its distribution to begin turning a few corners. Previously, we reviewed Jason Samilski’s ground-breaking content shift. Now comes AudioDrops Central, hoping to merging and extend successful content development and distribution approaches employed by other media, both past and present, for audio theater. Angry Viking Productions populates AudioDropCentral.com with varying collections of 10-15 minute multi-genre audio episodes. These range in tone from risqué humor to intense drama and through settings from the Civil War aftermath to Capone’s mob-run Chicago to the outer edges of the universe and the imagination. “Adam”, featuring the voice talent of John Tuttle and Andrew Staton, is the digital autobiography of a lost deep-space probe that gains sentience. It comes from AudioDrop’s Fantastic Worlds sci-fi series which fondly echoes old Golden-Age pulp and comic magazines while revitalizing plots with updated scenarios and circumstances. This initial resemblance to pulp mags and comic books is no coincidence. The goal of Angry Viking Productions, principally led by Eric Erickson, is to blend immersive FX, original music, and professionally portrayed, engaging scripts into a new 3D audioscape not unlike modern adult comic books that also feature complex plots and characters and thrilling, near-3D artwork exploding from the slick pages. To emphasize the intended connection further, the AudioDropsCentral.com web site visually displays series logos as comic book covers arrayed on shelves and stresses that all AudioDrop Central episodes somehow conform to an over-arching “universe”, just as most action-adventure comic books do. “The Soccer Mom”, featuring Elizabeth Moore as the anonymous title character with Jon Tuttle as her “detective” listening foil, is AudioDrops’ most popular piece. In this frightening tale of taught suspense and fatal impulse, the backdrop effects during Moore’s monologues spontaneously evoke flashback scenes which seem as real in the listener’s mind as video might to the listener’s eye. … to download a variety of productions Rated AD-G through AD-R for strong language and adult situations. 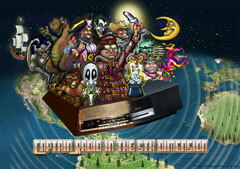 Captain Radio.Com Reviews originate on the Radio Drama Revival podcast. Subscribe to free weekly downloads of more top-notch, independently-produced modern audio drama from around the world at RadioDramaRevival.Com. Until next time, Audionauts™, this is Captain Radio™, signing off! Audiodrops™ are shorter audio productions- usually between 10 and 15 minutes- with full casts, immersive special effects, original music and engaging stories. Each episode is a full story in itself, as well as a piece in the larger mosaic of the AudioDrop™ Universe where our characters live. With each tale, listeners learn more about the rich tapestry filled with heroes such as Red Colt, Phineas Hawke, Samantha Bloodmoon and so many more. Velvet Curtain Series audios are tailored for mature audiences and present stories meant for adults with intricate storylines, mesmerizing characters and desperate situations. These stories are separate from the AudioDrop Universe, but keep an ear out for audio Easter eggs!